Donate That Fish -- Don't Flush It! Every fish owner is eventually faced with the dilemma of how to dispose of unwanted fish. All too often, the desperate owner resorts to the age-old method of flushing. Oh, the joy of the toilet - so simple, so quick, so effective. Or maybe not. Did pangs of guilt or sobbing children keep you from whooshing Goldie down the porcelain throne? If so, you might consider Plan B. Drag out that dog-eared state park map and locate a river or lake so Goldie can have a nice new home. The kids can visit on weekends. Everyone is happy, right? Wrong. Unfortunately for both the fish and the environment, neither option is an appropriate way to dispose of unwanted or sickly fish. It's better to donate the fish to a new home, and here's why. Isn't the septic system designed for disposing of ... well ... undesirable things? Yes, it is, but diseased fish should not be on the list of flushable items. First, consider the issue of cruelty to the fish. The debate over how much pain a fish is able to feel will rage on long past our lifetime, but there's little doubt that a live fish flushed into a system carrying all manner of noxious wastes will suffer in some way. Flushing a live fish is little more humane than dumping an unwanted kitten or puppy down an outhouse pit. Enough said. If that doesn't bother you, here's a more selfish reason to think twice about flushing. The fish carries with it the diseases or parasites that infected it in the first place. No matter how remote, there is always the possibility of passing those diseases on. 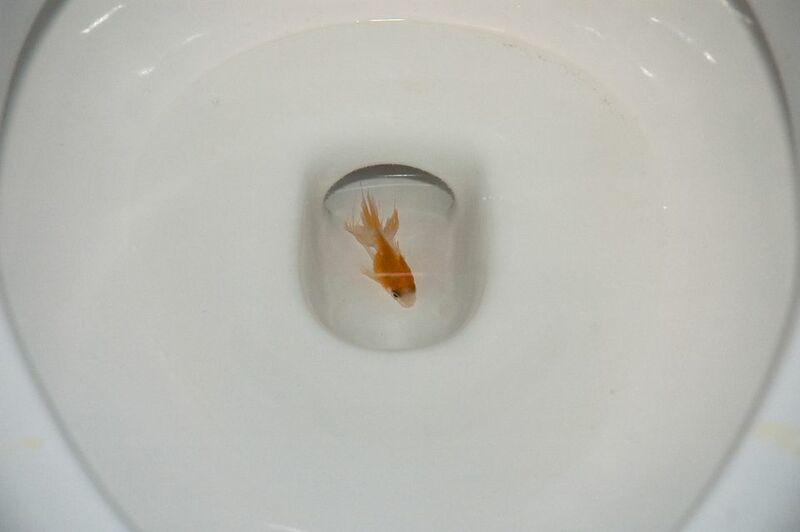 Would you feel comfortable using a toilet knowing that a diseased fish had just been swimming there? There are so many ponds, rivers, and lakes -- why not put unwanted fish there? It seems natural -- if the fish came from there in the first place. That is almost never the case. Thousands of non-indigenous species of fish are imported to the U.S. and other countries each year. Those fish do not belong in local waterways. Why? For starters, the living conditions are usually less than ideal. Water temperature and other environmental factors may be too harsh for them to survive. Bacteria and parasites they aren't normally exposed to -- and therefore aren't resistant to -- might infest them. There may be no suitable foods for them so they'll starve, or they may become lunch for the fish and other wildlife that are native to the area. The odds are not favorable for a long and healthy life for most non-indigenous fish. Those that do survive pose an even worse problem: Non-native fish can play havoc with the habitat. They may kill other fish and wildlife, destroy vegetation, and pass on parasites and disease. In some cases, it's possible for them to breed with local fish and create destructive offspring that Mother Nature never intended to exist, and we all know the perils of fooling with Mother Nature. Considerable damage has been done to many local ecosystems by non-indigenous fish that were carelessly dumped. Reach out to a local fish or pet shop. See if they will take your unwanted fish. Some will even pay you a small price for them. Ask other fish owners. Advertise if you have to. You may be surprised by how many fish owners are willing to adopt your fish. Look for a local fish club. Check to see if there is a fish club in your region. Odds are someone in the club will gladly take your fish. Donate to a school, nursing home or office. Any place that has an aquarium may agree to take your fish. If they don't have an aquarium, consider donating your own. Nursing homes and schools often welcome such gifts, and it might even be tax deductible. Diseased fish are a little more difficult to deal with. Obviously, they cannot be given away, but they should never be dumped into local waterways or flushed. Sick fish that cannot be cured should be quickly and mercifully euthanized before being disposed of in a sanitary landfill.